During my first pregnancy I was so excited to get the nursery set up. Very early into pregnancy I picked a nursery theme and colors, and made sure it was set up perfectly and waiting my your new bundle of joy before my daughter was born. That was a first child. 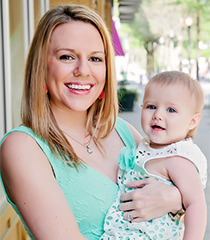 With your second baby you throw something together and plan on finishing it up after the baby is here. With your third I don’t know what happens but I assume having a perfectly finished nursery isn’t that high up on your list of priorities. 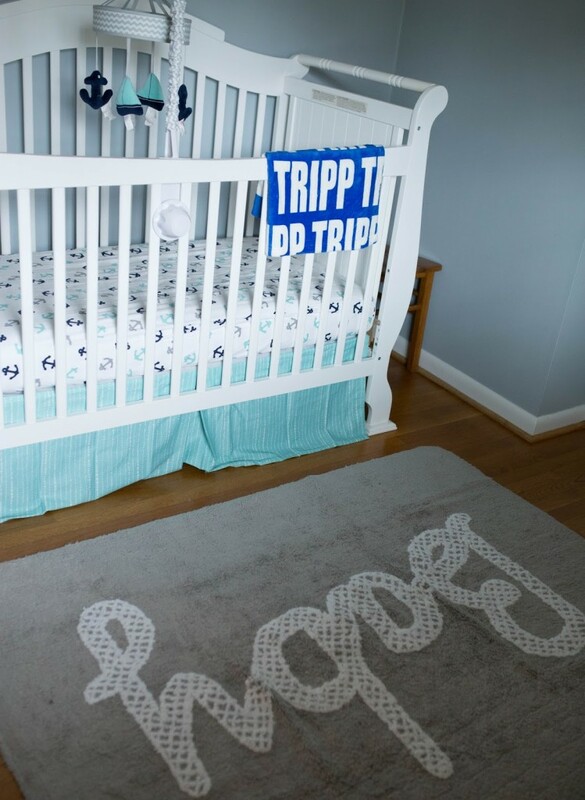 That said, I’m just now getting around to finishing up Tripp’s nursery. In fact, there are still girly prints on one wall that need to be replaced with manly ones. Or just moved to Maddie Grace’s new room at least. We ended up going with a nautical theme and keeping things simple. 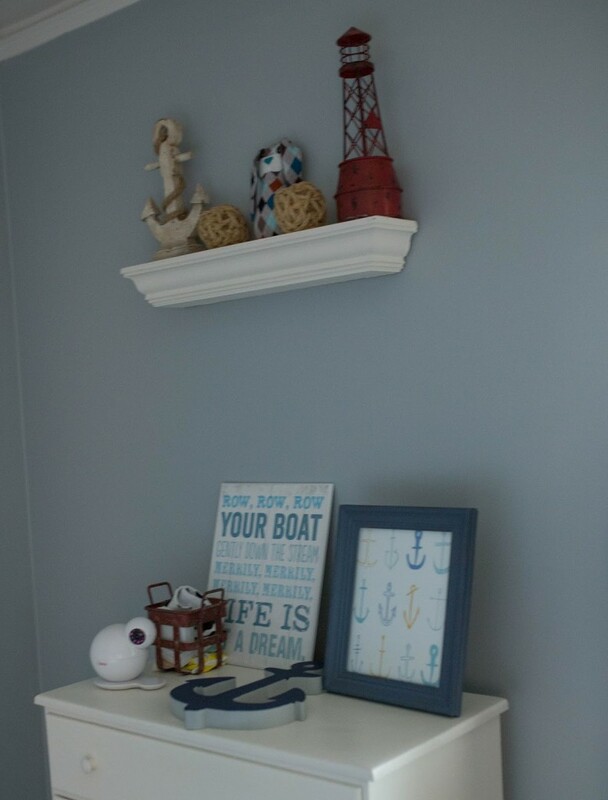 Same furniture and paint color as when it was Maddie Grace’s nursery, but we did add new bedding and some nautical decorations. Another new addition to the nursery is this adorable ‘Baby’ rug from Lorena Canals. I often place Tripp down on this rug (which is 100% natural cotton and made with non-toxic dyes) while I play/chase after Maddie Grace. He also has a tendency to spit up everywhere. The amazing thing is that this rug can go in my washing machine, no worry bout having to scrub where he spit up. Genius! It’s also super cute and is handmade using cross-stitch! Lorena Canals has a ton of adorable different styles of rugs that are especially perfect for nurseries. 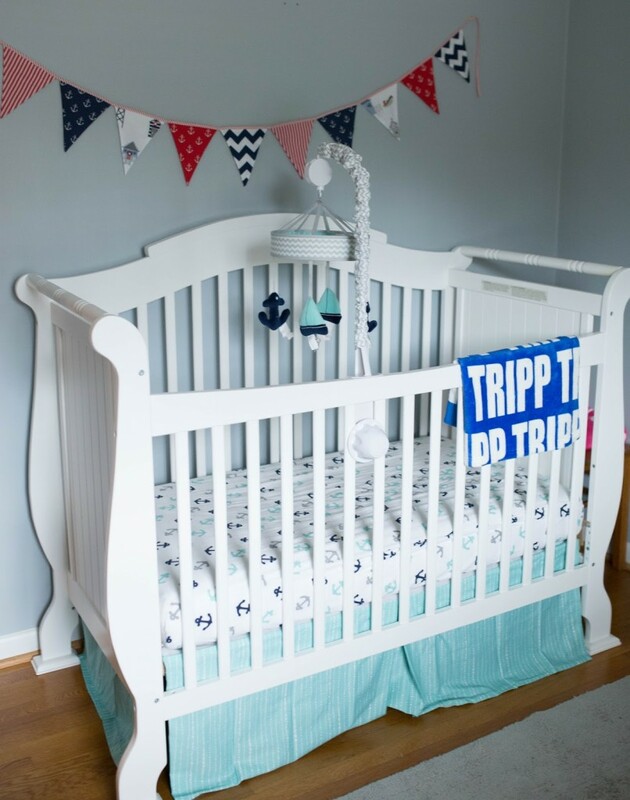 A lot of the decorations in the nursery are actually items that were used as decorations at my baby shower for Tripp! They work perfectly and I think it’s so special that I am able to use them in the nursery now. 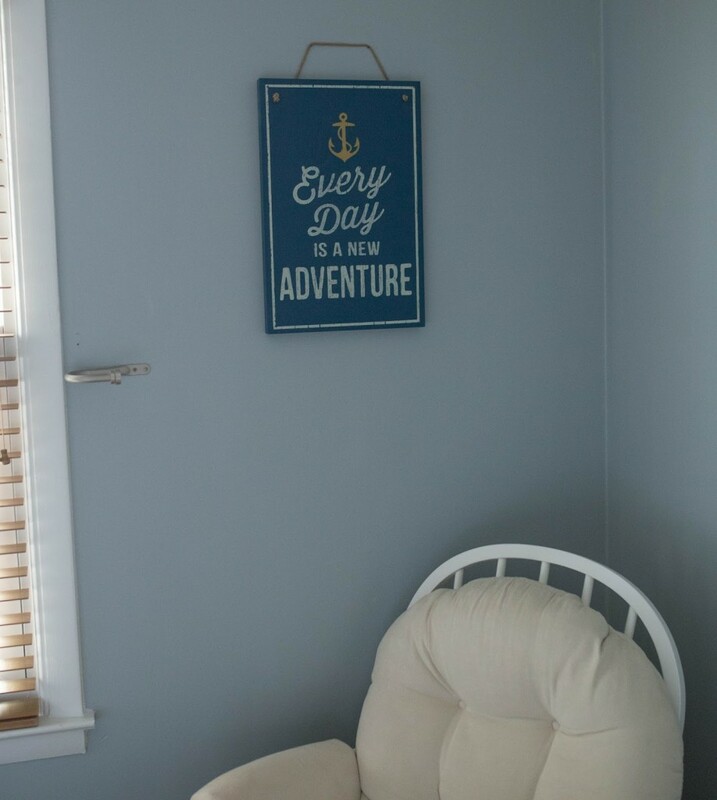 My Mother-In-Law gave Tripp an adorable new piece of wall decor for Valentine’s Day and I think it’s perfect for above the glider. Do you like to have rooms perfectly decorated right away or are you more a do it over time person? I’d love to hear more below! I love the nursery! Stunning photos! Re purposing decor is such a great way to stay budget friendly. Awesome post. Yay! Glad you could up cycle your shower decorations!! Absolute love it, makes me want to decorate another nursery! I don't think they'll notice for a while haha! Our nursery for number 2 is a mess right now. It's been painted with random pieces of furniture strewn about the room (an old eliptical works as nursery decor, right?). My husband figures the baby won't sleep in there for a few months after it's born anyway, so why worry (although, I'm worrying). Such a cute nursery! Anything I do is always a work in progress. I change my mind constantly! I love the nautical theme! I definitely have found that I end up taking my time when finishing a room and never really feel like it's completely done. I'm sure with our second child it will take my forever to get the room where I feel like it's actually done! 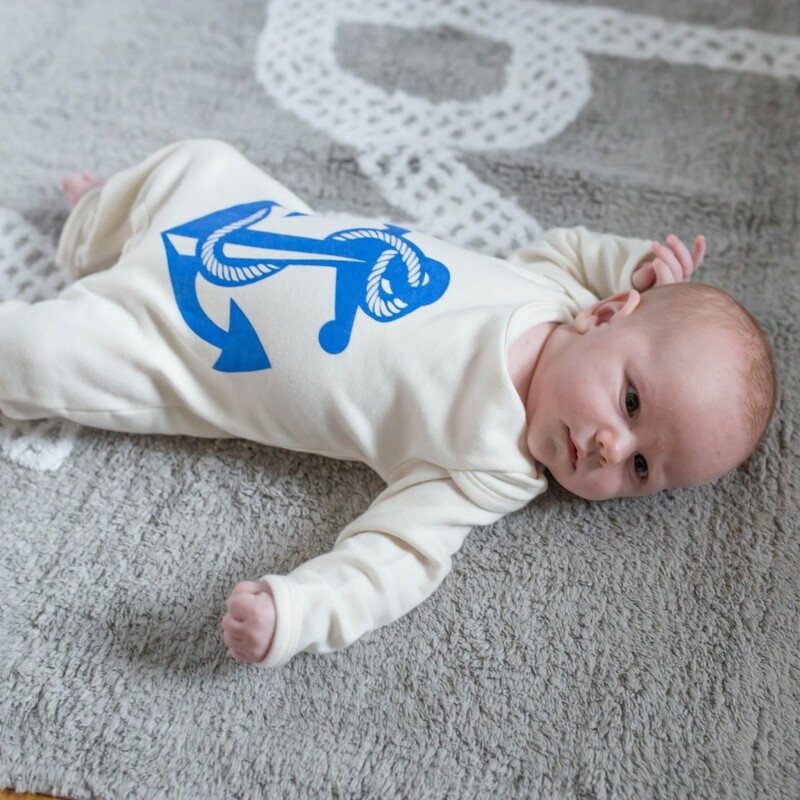 Where did you find the "row your boat" print and the anchor romper? Adorable!